With a name like Seal, it's hard to forget who the English born musician is. Seal is your Connector of the Day. Born in London, England to Nigerian and Brazilian parents, Seal's legal name is Seal Henry Olusegun Olumide Adeola Samuel. Olusegun means "God is victorious." Seal began singing during the 1980s and had the odd job in places like Thailand and Japan before returning to London. His big break came when he met a music producer named Adamski, who gave him the lyrics to a song called "Killer" which was a huge hit in 1991. Seal's second album was released in 1994 and it included the huge hit single "Kiss from a Rose." 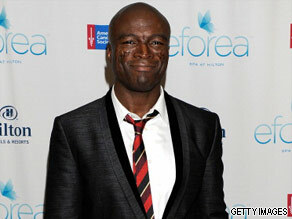 Seal has won a variety of music awards including the BRIT, MTV and Grammy award. The singer is now out with his seventh album called "Commitment." Here's your chance to send in your questions to Seal. Please leave your questions for Seal below and be sure to include where you're writing from.